If you are planning a holiday in Texas, you may end up at Dallas/Fort Worth International (DFW) airport and start a round trip with a rental car. Thanks to the possibilities offered by the Internet and modern applications, it has never been easier than it is today to choose a rental car long before the start of the journey, to reserve it directly at the airport, to pick it up immediately after landing and to start driving. Car rental is the key to this simplicity. You can compare all offers of all car rental companies based at the airport with Driveboo and choose the vehicle that is best suited for your trip. Just a few mouse clicks are all you need to do, and you have already secured the best offer for a rental car. Where can I pick up my Rental Car at Dallas Airport? All car rental companies' offices, the DFW Rental Car Center, are located at the southern edge of the airport, near Highway 183, where shuttle buses run at short intervals because the distance to walk (with luggage) would be a little too long. The parking spaces of the individual providers are scattered around the premises around the offices. You will also be taken here. Which suppliers are located at Dallas/Fort Worth Airport? Where can I refuel my rental Car at DFW Airport? Suppliers of rental vehicles are particularly sensitive if customers do not return their cars with full tanks. This requires additional effort and time, in which you would have liked to rent the car to a new customer. This is why, in these cases, you are guaranteed to incur above-average tank costs. Avoid this by filling up your car just before you return it. Petrol stations can be found directly on Highway 360 or 114, and if you are coming from the east, if you turn left at Shell 114, if you are coming from the east, you can use Shell in the south of the airport (at 360) or Exxon in the north of the airport. The opening hours are American generous. Just plan some time, because nobody wants to miss their flight because of the fueling. How long does it take to get from Dallas Airport to other cities by car? The airport is located between the metropolises of Dallas and Fort Worth - just north of the centre, if you look closely at it. Because in the USA the distances to other domiciles are simply gigantic, the country and its highways seem endless, we give you some pointers for orientation. It is also worthwhile to take a motorcycle from El Paso to Dallas. Since the airport is not a provincial airport, airplanes take off and land here on a regular basis and tens of passengers pick up and return their rental cars, a case will rarely arise: That you're in front of a locked door at the rental shop. Even if your flight arrives late, there will be a way to get your rental car. If something has gone completely wrong, you can either switch to another provider to get out of the airport, or you can use the shuttle services to Dallas or Fort Worth. If we give the following figure, you know what is happening at this airport: 66 million passengers in 2016! It is currently the tenth largest airport in the world and is the hub of American Airlines. Further figures? 7 runways, more than 170 gates and 5 hangars are currently available. If you want to extend the offer, there would be enough space available. The Trinity Railway Express provides local public transport, while the TX-97/TX-183 or TX-121/TX-183 provide access to the road network. 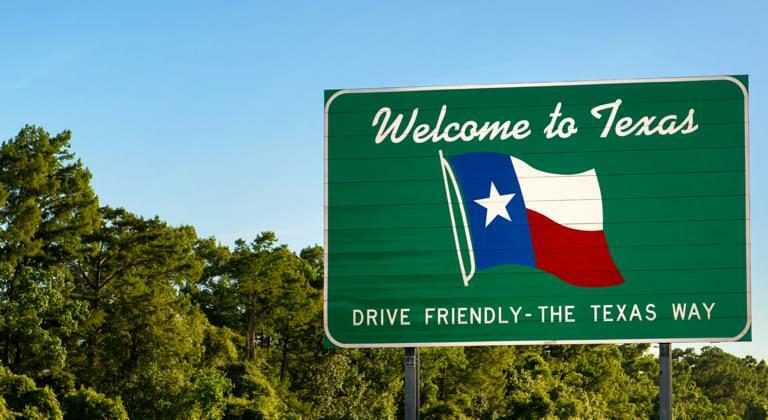 Texas is one of the largest states in the USA. In order to visit more than 1-2 metropolises, you need two things: plenty of time and a rental car. The distances between the most interesting stops are often more than 200 km. It is therefore worthwhile to look for a car suitable for this trip. The most important change you have to get used to is the units. In the USA, distances and speeds are given in miles and miles per hour. Because one mile corresponds to about 1.6 km, distances appear shorter and speeds are slower than they are. Attention to speed limits: American sheriffs are not exactly known for tolerating the lawn. The same applies to driving under the influence of alcohol. An international driving licence should also be available. On the other hand, you can overtake on both sides of multi-lane roads. It's best to read all about the traffic rules in the airplane at the latest, so that you can sit behind the steering wheel of your rental car in the states completely relaxed.